Okay, guys. No more stalling. If it wasn’t “officially” crunch time for Christmas shopping before, it definitely is now! With Thanksgiving 2018 memories in the bag, we’re turning our attention to crossing “gift hunting” off our holiday to-do list. We actually keep things relatively low-key among our two families (John’s immediate family and my own) by agreeing to gift one item apiece to each other, but it’s still a task we take pretty seriously. We hate the idea of giving gifts they don’t really need, so we think long and hard about what we can give them that serves a purpose. The number one item on that list? Coffee! This season, I’m teaming up yet again with my favorite folks over at Snapfish to show how you can treat the coffee lovers in your own lives to something fun (and functional!) this holiday. 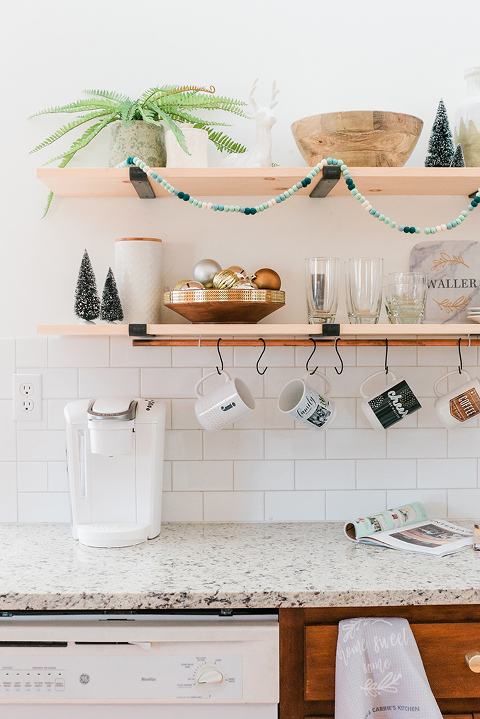 Scroll on to learn more about the custom photo mugs and other kitchen accessories I put together as experiments for gift ordering later this month, plus the step-by-step tutorial for our new DIY coffee mug rail in case you really want to wow them come Christmas morning. First, the mugs. This was my first time ordering custom mugs from Snapfish, and I’ll admit that I was a little worried about being able to find designs among their pre-built templates that would suit our mod, clean-lined aesthetic. I’m not a big fan of ultra bright patterns, but I was excited to find out that that’s not all the website offers in terms of templates. I was able to choose four really simple designs for our mugs—one with John’s initial for his daily cup of coffee, a wood-look labeled design with my own name on it, plus a couple of custom photo mugs with our engagement pictures printed on them. I actually kept my cart open in its own separate tab in my browser so I could refresh it every time I completed a mug design and added it to my collection. That way I could be sure that the photos and designs I chose would look good together on display in our kitchen. That might be a little too OCD for everyone, but it worked for me! Oh, and I should mention that the interface for creating custom designs was super easy to use, too. 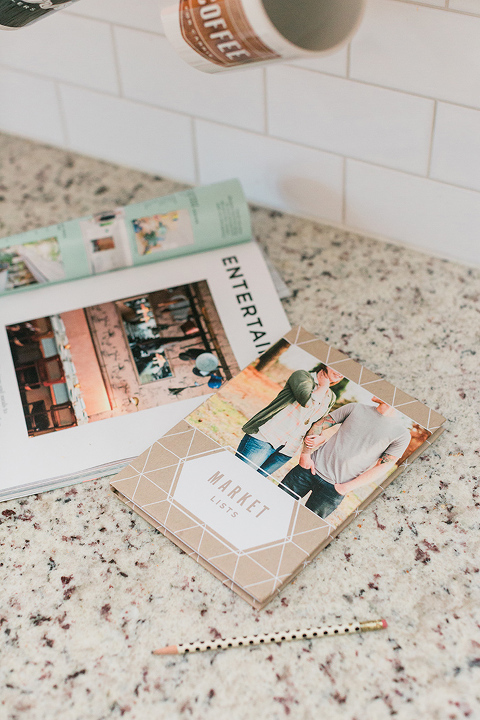 The do-it-yourself layout allows you to get really creative with multi-photo arrangements, and, whether your style is classic like ours or punchy (think: chalkboard designs, metallics, and even botanicals), the site has plenty of design options for you to play around with. It’s also a cinch to upload your own photos to the product builder. You can pull directly from places like Instagram, Facebook, and Google Photos, which saved me so much time. If I hadn’t had that option, I would have had to dig out my external hard drive to access the older photos I wanted to include. Being able to pull from my social media accounts saved me at least an extra half hour of hassle. Now for that DIY I promised! 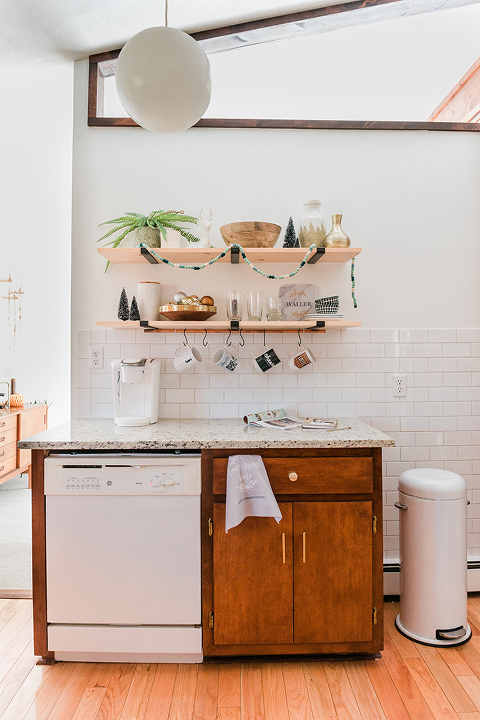 I wanted to figure out a way to really show off our new collection of custom kitchen items (did you see we also picked up a custom tea towel with our last name on it?! ), so I built a quick DIY Custom Photo Mug Rail to go under our new open shelves. Scroll on to learn how to recreate the project. Step One: Figure out how long you want your rail to be. I ended up using a 1/2-inch unfinished copper pipe for my rail because we already had it handy, and I also really liked the look of the patinaed copper against our wood shelves with their matte black brackets. The rod was already cut to a size that worked for us (34 1/2 inches long), but if you need to trim yours down a bit, you can use a pipe cutter, like this. Step Two: Next, choose your spot for the rail, and mark where you’d like the hooks to go that will attach it to the underside of your shelves. I used three 1-inch white hooks to support our copper rail, spacing them roughly 12 inches apart from each other under the shelves. Mark where your hooks will go with a pencil, pre-drill the holes, and then screw the hooks in place. Step Three: Slip your rail gently through the hooks, making sure that it feels strong and sturdy. If you feel like the rail needs more support, screw in a couple more hooks between the others. 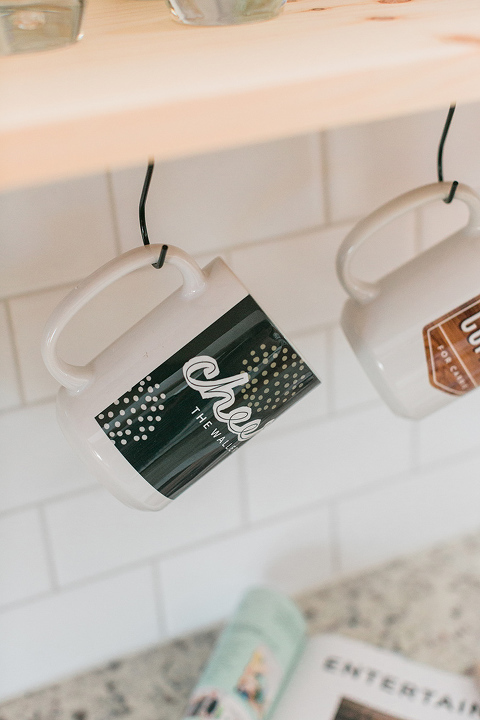 Step Four: Loop S-hook hangers over the rail, and then slip your custom mugs right over the hangers to allow them to swing freely for easy grabbing in the morning. NOTE: When figuring out where to hang your rail, make sure you keep it away from the wall by at least a few inches. Otherwise, the mugs could bang into the wall and break. We love how the custom collection turned out (it’s such a treat to see them swinging there on our DIY rail every morning! ), so I’m definitely planning on ordering more to give to friends and family this Christmas. Wouldn’t they make for the perfect personalized stocking stuffers? I vowed that this would be the year that we finally find functional gifts that look cool, too, and I think this idea definitely nails that criteria. What types of personalized photo gifts would your family like? I love trying to think beyond the standard photo gift (remember my custom ’12 Reasons Why I Love You’ photo book from last year? ), so if you have any clever ideas, tell us about them in the comments below. Whatever inspiration strikes your fancy, be sure to use the code ‘SANTA40‘ now through December 31, 2018, to enjoy 40% off your order sitewide.